Malibu Search And Rescue Team on the scene investigating an incident where a woman was killed after her car went over a cliff. MALIBU—A car driving on Malibu Canyon Road fell 500 feet off the side of the road killing the driver instantly on Tuesday, July 3 at 3:30 p.m. The victim has identified by the coroner’s office as Jayne Fleming, 66, from Granada Hills, The Malibu Times reported. She was driving a blue Toyota Camry headed northbound when she crashed and traveled over the edge of Malibu Canyon Road north of Pacific Coast Highway. Malibu Search and Rescue Team took to Facebook to report details on the accident. “A fire helicopter medic was lowered to the victim…She unfortunately perished in the accident, which is under investigation. 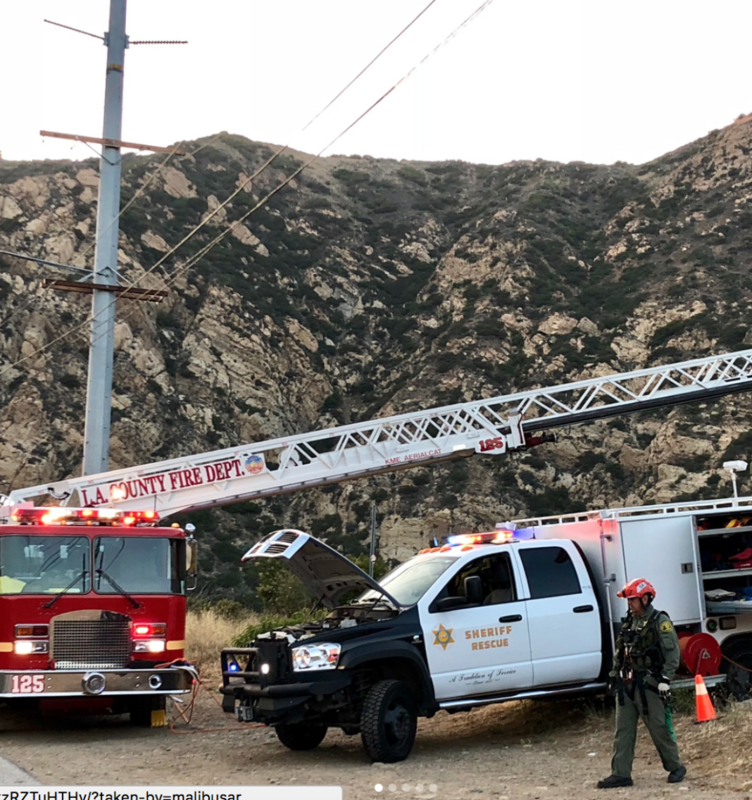 Solid teamwork by fire and Malibu SAR rescue personnel for over six hours to evacuate the woman from the canyon,” the Malibu SAR Team noted on Facebook page. It took Malibu firefighters and SAR rescue personnel over six hours to evacuate the victim from the canyon. According to the California Highway Patrol, following the accident, Malibu Canyon Road was closed between Piuma Road and Pepperdine University. One lane was opened to let traffic through one car at a time. The Los Angeles County Fire Department indicated via Twitter, the car was found at 7 p.m.
Fleming was driving a 2015 blue Toyota Camry. Witnesses informed California Highway Patrol Officer Kay that the car accelerated from 45 mph to 70 mph while going from the inside lane to the asphalt turnout lane. According to witnesses, while going across the dirt shoulder, the car crashed into an embankment and went off the road. Previous articleKKK Didn’t Win After All – Michael Survived!